Mecum offered 750 collectors cars for sale at its Monterey auction selling 7 for over a million dollars. A 1961 Ferrari 250 achieved the highest price. Mecum Auctions, the largest auctioneer of collector cars in the world, had 650 cars on offer at its three day-time auctions during the annual Monterey classic car week in mid-August 2014. Seven cars sold for more than a million dollars each while a further 8 achieved bids higher than a million but failed to clear the reserve price. Mecum’s top result at its 2014 Monterey sale was $2,475,000 for a 1961 Ferrari 250 Series II Cabriolet. The highest bid at the auction was also for a Ferrari – $5,750,000 for a 1955 Ferrari 375 MM Spider. Mecum’s sell-through rate was 56% for a total auction grossing almost $35 million – the highest Monterey earnings ever for Mecum. * 10% added as auction premium to Mecum’s stated hammer prices. 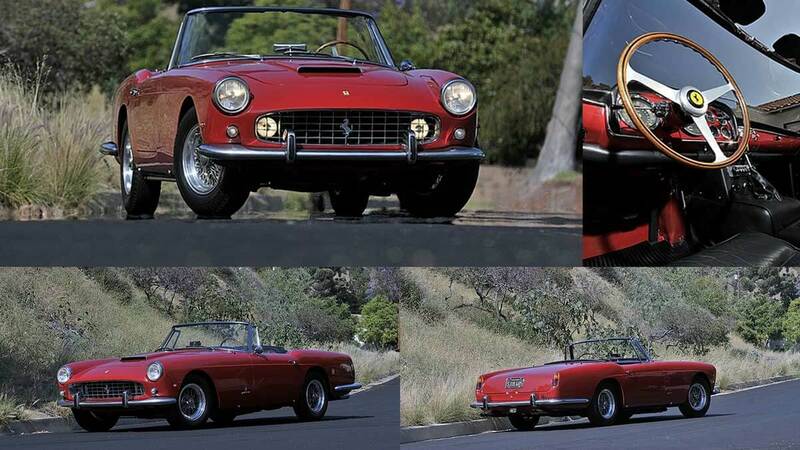 Like every other auction during the 2014 Monterey classic car week, Mecum’s top result was also for a Ferrari – $2,475,000 for a 1961 Ferrari 250 Series II Cabriolet. The Ferrari 250 Series II Cabriolet has in recent years appreciated slower in value than the more illustrious 250 GT Coupe. The car on sale here has done only 5,200 km and has won the Enzo Ferrari Award at the Desert Concorso in Palm Desert, California, earlier in 2014. Mecum’s second highest result at its 2014 Monterey sale was for the 1972 McLarent M20 Can-Am racing single-seater. It was the factory entry in the 1972 season and raced by Peter Revson and Denny Hulme. The only pre-Second World War car clearing the million-dollar level at the Mecum sale was the 1930 Duesenberg Model J Torpedo Berline Convertible. Despite being produced during the grips of the Great Recession, the Duesenberg Model J had a grandeur unsurpassed by any other American automobile produced at the time. Two 1955 Mercedes Benz 300 SL Gullwing cars sold for than a million dollars each at the Mecum Monterey 2014 sale. Two further 300 SL models achieved even higher bids but failed to clear the reserves: $1,750,000 for a 1963 Roadster and $1,650,000 for a 1957 Roadster. Eight cars attracted bids higher than a million dollars but failed to clear the reserve price at the Mecum Monterey 2014 auction. The highest bid was $5,750,000 for a 1954 Ferrari 375 MM Spider – a similar model sold for just over $9 million at RM Auctions’ Monterey 2013 sale.